Can I Remove Split Ends Without Cutting? We all want our curls to look their best. When split ends pop into the picture, it can be a real nuisance. Many naturalistas have questions about splits ends and how to best solve them. What causes split ends? Do split ends mean my hair is unhealthy? Can I remove split ends without cutting? Well, let’s get to the bottom of these questions! Split ends are when the cuticle of the hair shaft becomes raised and causes the hair to split in two. While this usually is found at the bottom of strands, if left untreated, the keratin bonds can continue to weaken up the shaft all the way to the root. Split ends are caused by a few different factors. Basically, anything that is damaging can result in split ends so you want to be careful how you treat your hair. From brushing with a rough brush and rubbing strands with a towel or overusing heat tools, anything that causes damage to the keratin bonds can create split ends. For most people, this pesky problem is hard to get to the root cause because there are so many different factors at play. Do Split Ends Mean Unhealthy Hair? Based on what a split end is, it is usually a sign your hair is under some distress. Do split ends mean your hair has reached new levels of unhealthiness? Not necessarily. 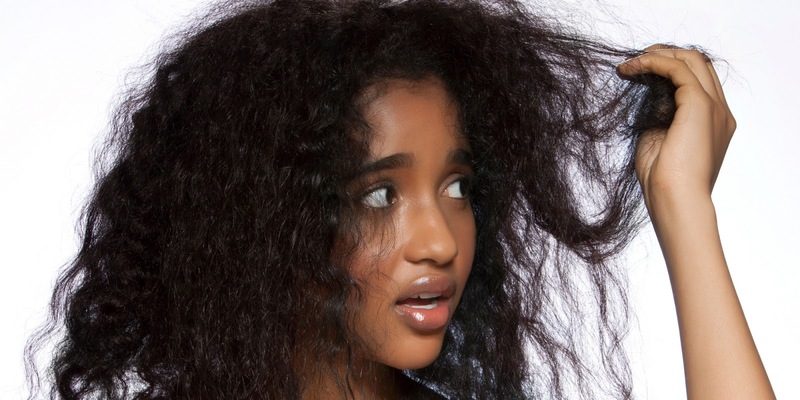 Does it mean your hair is more vulnerable to further damage? Yes! Hair that seems to get split ends on a regular basis is probably hair that needs to be handled with more care. Maybe a gentler brush is needed or a keratin building protein mask. It will depend on the person as to what type of solution is best suited. While split ends are a sign of a problem, there are ways to prevent them from happening. The best way is to make sure your hair has a routine that is gentle and non-damaging. Avoiding the use of rubber bands in your hair or daily heat tool usage, will reduce these pesky hair worries. The first line of defense for most people is to simply snip the split ends until they reach the healthy part of the hair shaft. While this is a quick solution, you may lose precious length, which is a real concern for curly hair. Unfortunately, if the split end is at the bottom of your strands, cutting will most likely be the only option. You can hide them or make them less noticeable with the use of a sealer such as coconut oil, but the underlying problem will still be there.